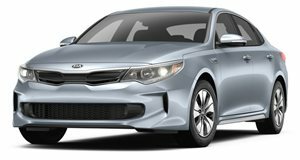 Two trim levels both afford ample equipment for a decidedly comfortable Kia Optima Hybrid. A 2.0-liter combustion engine pairs with an electric motor for combined power of 192hp and a 42 MPG economy rating. Front wheel drive is the only option, through a 6-speed automatic gearbox. The available Technology Package includes a panoramic sunroof, ventilated front seats, heated rear seats, and rear-side sunshades. Available safety features include forward collision warning with autonomous emergency braking, lane departure warning, and blind spot monitoring.